Joen Wolfrom’s The Magical Effects of Color certainly has many wonderful, colorful, even inspiring pictures, ut this book takes a different route to the muse. The rush to make something like what we’ve seen in a picture is like the satisfaction we get from the gift of a flower: immediate, and fleeting. The pleasure offered by this potent book is more like the gift of a gardener’s knowledge: slower to take in, but once yours, never lost, and always subject to further growth. Wolfrom sets out to give us nothing less than this by sharing in marvelously written and clearly illustrated detail the results of her own study of color. She’s a quilter, and all the works shown are quilts, but the insights, principles, and exercises she unfolds for us come straight from nature and point toward visual arts of every sort. It’s totally unnecessary to think of yourself as an “artist” to join in Wolfrom’s journey, as she herself attests. “To a layman like myself,” she says of her early days as a quiltmaker, “there was no indication that a relationship between quiltmaking and art existed……Quiltmaking seemed like a safe and understandable activity for someone with years of sewing experience.” Only dissatisfaction with the visual impact of her own skillfully made quilts led to Wolfrom’s eventual discovery of “nature’s clues to the mysteries of color, illusions, and design.” If you’d like your work, in any medium, to have more depth, iridescence, luminosity, and transparency, you’ll find help—and lasting inspiration—in this magnificently generous work. Joen Wolfrom subscribes to the Impressionists’ edict: “Paint what you observe…paint generously and unhesitatingly, for it is best not to lose the first impression.” Her color workbook is on target, but it differs from Jinny Beyer’s in its painterly approach to color design. Joen teaches about color admirably and without condescension, even for those without art training. She also suggests ways to achieve certain moods using color, as well as methods for introducing three-dimensional richness into your work. A comprehensive color quilt gallery adds to the book’s value. Your stitching is great, but how would you like to make your quilts take on a new dimension? In this unique book, Joen Wolfrom, author of Landscapes & Illusions, now in its third printing, shows experienced beginners through advanced quiltmakers, needle artists, textile artists, and others how they can add a new vitality to their quilting and create special effects by making full use of the properties of colors. The book covers the full range of color, from the basics, with a complete explanation of the color wheel and its basic terms, to such technical subjects as how to create mist, shadows, luster, luminosity, highlights, reflections, and transparency in your designs. Let Joen help solve the mystery of the use of color in quilts. She has a fresh approach to exploring color as she treats color not only technically, but also with intuition, emotion and subjectivity. Of course, the basics are thoroughly covered, but so are dramatic illusions such as mist, shadows, luster, luminosity, highlights, reflections, transparency, and more. If you are intrigued by color or are always fine tuning your color skills, you’ll want this book. Another Houston favorite! Joen Wolfrom’s new book concentrates on color and its properties and especially the effects that can be obtained through its careful use. Even more specifically, the book deals with color and fabric along with how these can be best exploited in quilts. Those looking for quick fixes and instant formulas won’t find them here. The Magical Effects of Color is for the serious student of color and its application in quiltmaking. The author doesn’t tell you that if you use color X and color Y in a three-color quilt, the third color should automatically be color Z. She is not seeking to make overnight color wizards of all her readers. Instead, Ms. Wolfrom does a good job of offering a careful explanation of color and how to achieve the best effects in quiltmaking by its manipulation. The first area covered in The Magical Effects of Color is color families and color personalities and how we respond to color. The author then addresses using color naturally and discusses hues, tints, shades, and tones. Color wheels are covered as are types of color schemes such as analogous, monochromatic, etc. A four-page color section does an excellent job of illustrating these schemes as well as some of the effects of color use. Ms. Wolfrom carefully explains the light effects, among them luminosity and luster and the illusions that can be obtained through color use. The special value of this book for quiltmakers lies not just in the in-depth information provided, but in the further elaboration on the combination of color and fabric. The author discusses buying fabric for its color and how to build a backlog of fabric for your work. Her advice to buy fabric “without regard to any particular project” and to “select fabrics by what appeals to you at the moment” is perhaps an unusual approach (for some quiltmakers), but it’s solid advice for anyone seeking to stockpile a wide selection for quiltmaking. The design relationship to fabric use is explored as is the quilting design. Having provided a solid base of color information, the author talks about the use of color and design in traditional quilts and about creating your own designs. This later subject includes a discussion of the elements of design. Having covered the topic of color, Ms. Wolfrom provides a segment of fie exercises and three activities to reinforce her approach. Five traditional quilt patterns and five additional patterns (traditional, traditional variations, and original traditional designs) are presented along with the challenge to creatively use color and values to make your own version of them. Sections on perspective and pattern drafting are included along with a bibliography and suggested reading and study list. Especially impressive is the selection of 86 color photos of quilts. In addition to the general information on each photo, including the title, date, size, maker, and maker’s city and state, Ms. Wolfrom details the specific color effects to be noted in each quilt. This is a valuable extension of the learning experience for the readers and well demonstrates the material covered in the text. The Magical Effects of Color is a good source of information for those seriously interested in what color is all about and how to use it to best advantage in quiltmaking. But while appreciating the author’s expression of gratitude to deserving teachers in her past, many readers will have little patience with the large numbers of quotes from some of the world’s greatest artists. However interesting in themselves, these seem to interrupt the otherwise smooth flow of information, but it is a small complaint and it’s easy to skip over the quotes and proceed with the text. 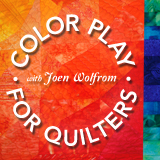 If you’re interested in learning more about color and its use, especially it applies to quiltmaking, Joen Wolfrom’s The Magical Effects of Color should be in your quilt library.